Want to cook a dish really quick n easy, yet “oh so light n delicious”? Don‘t know where to begin…here it is! Weaned your baby off mother’s milk? Wish to introduce the li’l one to a healthy, tasty, easily digestible solid food? …here it is! Your tummy throwing tantrums? Yes we are busy cooking medicine for you…here it is! Wash ginger, curry leaves and coriander leaves in salt water. Drain and keep aside. Cook dhal in a pressure cooker along with water, turmeric powder, curry leaves and a dash of ghee. While dal is getting cooked…. You can do grinding. For this, first, grate raw coconut. Grate ginger after peeling its skin. Grind all ingredients listed under “For grinding” using a few spoonfuls of water. Add this ground chutney, water and salt to the cooked dhal and boil it for 5 to 10 min. on low flame. As you feast your eyes watching the light and bright yellow coloured rasam boiling with the jeera-ginger-pepper combine, it’s time to reach out for a small skillet to prepare seasoning. Heat ghee in this skillet. Put mustard seeds. When they crackle put cumin seeds. Switch off the flame. Immediately pour it on to the boiling rasam. Squeeze out the juice from fresh lime and add to the rasam. Garnish it with thoroughly washed and chopped fresh coriander leaves. Toor Dal (with lime juice) Rasam is now ready. Serve hot with steamed rice or as plain soup. 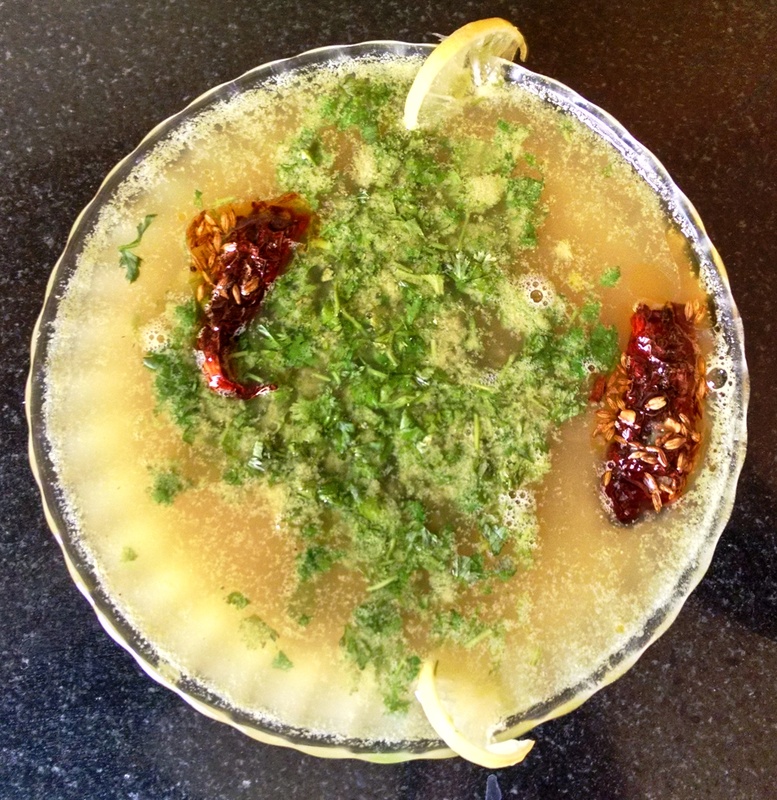 While there are plenty of Rasam varieties, with a bit of experimentation, imagination and creativity, one can customize and create many more! At Sarapaaka, we present select Rasam recipes that are healthy, nutritious, tried and tested over generations, easy to prepare and kindle you with ideas that help create variations on your own.